This breakthrough method of releasing the soul ties will clear your brain and give you back your energy and focus--download this amazing ebook and experience it now! 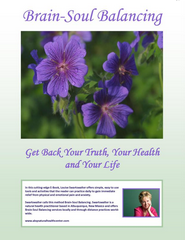 Enter your name and email below to receive this complimentary E-Book. At Albuquerque Natural Health Center (ANHC) we offer a wide range of alternative healing services, holistic health coaching, and wellness groups to achieve optimal health and well-being. Our unique, comprehensive approach combines the therapies of Quantum Biofeedback therapy, brain balance programs, nutrition, herbs, homeopathy, Hanna Kroeger Methodology, trauma release work, and lifestyle management. We work with individuals, groups, and families seeking help for pain, allergies, anxiety, headaches, depression, sleep issues, weight loss, fibromyalgia, ADD/ADHD, Autism and other imbalances. And the good news-as you’ll see from the many positive testimonials we’ve had great success! To assist and educate individuals and families on their path of healing their physical, mental, emotional and spiritual selves in order to reach their full potential and allow their gifts to shine. In combining the therapies of Quantum Biofeedback, our brain programs, nutrition, herbs,homeopathy, Hanna Kroeger Methodology, trauma release work, and lifestyle coaching , healing takes place on the physical, emotional, mental and spiritual levels… healing of the whole person; not just the relief from the symptoms. Louise Swartswalter, ND, CBS, CNHP, is a “health detective”, working to “crack the case” and designs an individualized plan for you! Using our medical intuitive skills, kinesiology, biofeedback and other tools, we zero in on the underlying source of the imbalance. Don’t put up with those nagging symptoms for one more day! A symptom is nothing more than a sign that you need to shift or change. Most of us ignore these signs until we experience great pain. The body wants to return to homeostasis, our natural state. We will take a look at where you are stuck in your life clarify your goals and begin your abundant life. Click here to sign up for your strategy session.